Lori Schultz and Assistant/Daughter, Jill Jackson "Century 21 Hometown Realty", California's Beautiful Central Coast With nine offices located along the Central Coast and Bakersfield, this mother/daughter team brings you knowledge and experience. They feature up to date advertising of all local listings on their website www.LoriSchultz.com as well as advertise in their company's exclusive full color magazine with 109,000 copies distributed in three counties and a new issue every six weeks. If you are looking for an Experienced Top Producing Agent and professionalism that you can count on, please feel free to call Lori Schultz and Jill Jackson at (805) 474-4171 or email at LoriAndJill@c21home.com. "They'll Help You Arrive at the Ultimate Destination". I want to help you buy or sell real estate! Visit my friendly and comprehensive website to find community info, and all the MLS real estate listings on the central coast. Go to www.slocoastal.com to find real estate & homes for sale in San Luis Obispo County, community & relocation information in California's Central Coast areas of SLO, Arroyo Grande, Pismo Beach, Grover Beach, Nipomo, Santa Maria, Morro Bay & Los Osos. Call Hae-Soo anytime (805) 459-9392 or email hsferguson@sbcglobal.net. Verenice White - Jones, Goodell, and Assoc. The San Luis Business Center features Twenty-Five Individual Executive Offices and Thirty Open Office Spaces. Each office is furnished and fully wired for network and high-speed broadband internet services. The rent includes all basic utilities, heating, air conditioning, T-1 Internet service, janitorial, trash, kitchenettes, a mailroom, a copy center, three conference rooms, a large break/ lunch/ kitchen room and a receptionist area with a receptionist. 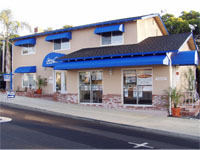 Now in its 36th year of business, Mid-State Bank was founded in 1961 by seven local businessmen and is the Central Coast's largest locally owned and operated bank. The Bank has 23 offices extending from Paso Robles to Santa Barbara. Real Estate and Property Management business covering Arroyo Grande, Grover Beach, Avila Beach, Oceano, Nipomo - featuring homes, acreage, condos, mobiles, vacation rentals, long term rentals. The Prudential Hunter Realty specializes in real estate sales from Santa Barbara to San Luis Obispo. I provide a written guaranteed sales price to all my sellers, and 1-year buyer home warranty to all of my buyers. As a sales professional, I pride myself in working to meet my clients needs. I will achieve the results you can count on, whether you are looking to buy or sell residential, commercial or investment properties. A Central Coast native, and Cal Poly graduate with a business finance degree, I combine sales, marketing and technological expertise with enthusiasm and personalized professional service. Specializing in beach homes and coastal properties in the following Central Coast areas: Morro Bay, Los Osos, Arroyo Grande, Pismo, Shell Beach, Cayucos, Grover Beach and San Luis Obispo. Also knowledgeable in regard to investment properties and 1031 exchanges.